Love the maxi skirt for summer. Your choices here are bang on stylish and affordable. Indeed a classic white tee is the perfect accompaniment to a statement maxi! Your picks are just as fabulous as the ones in the original look Lilli! Happy new week! Bellissima la gonna che hai scovato, una validisisma alternativa a quella originale su cui ho sbavato per un bel po'! Bellissima la gonna, e splendida interpretazione! 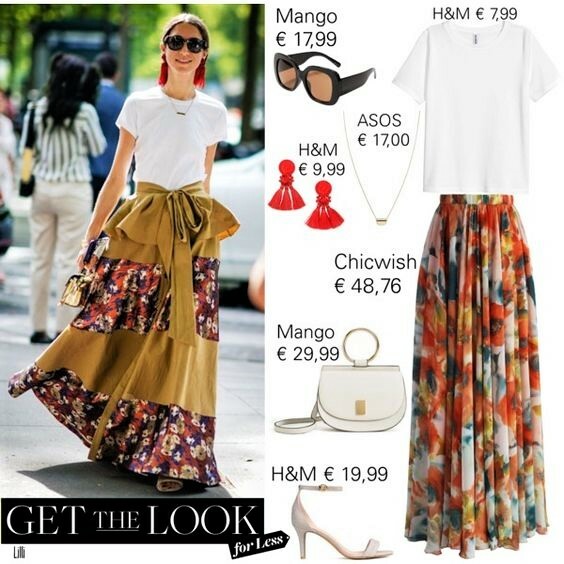 Quella maxi skirt è stupenda! Sei davvero brava a ricreare questi look! What a lovely streetstyle of Paris FW. The skirt is amazing. But your copy for less Look is also fantastic. Skirts like these needs a simple white basic shirt. I also like the earring. I see those everywhere. A big trend too. It's a bohemian style perfect for good weather, cool and very feminine, I loved the oversize glasses! Happy start of week Lilli. That skirt is just stunning, like, what a piece. I love your Chicwish find though Lilli. Another stunner!